Have you heard of the Beltway Loop? Image by WMATA. Expanding Metro is always a hot topic, and most people know of the Silver Line — part which is under construction — or the proposed downtown loop. But do you know about the Rosslyn Y, the Brown Line, or the Beltway Loop? 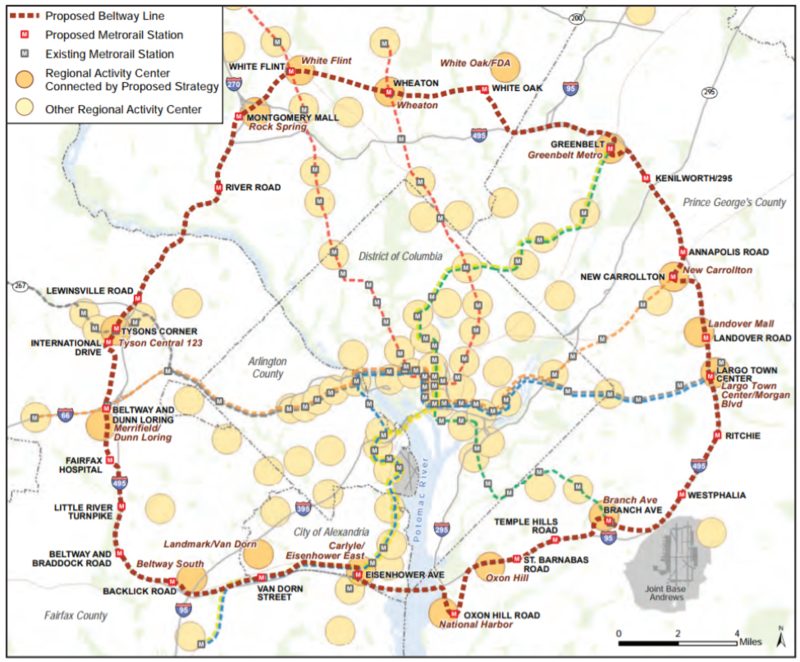 These proposals were reviewed and analyzed in past Metro programs like Connecting Greater Washington and the Regional Transit System Plan. The studies looked at things like the impact on both rail and bus ridership, analysis of the areas served, and physical limitations of surrounding area. Based on the findings, recommendations were made to either kill the idea or incorporate it into other plans. What it is: The concept for this proposal was to create a bypass for the Rosslyn Station. In one version of the plan, the Silver Line would turn south after the Courthouse Metro Station and terminate at Ronald Reagan National Airport, providing a connection between Virginia’s two airports. The new bypass would have had an estimated 20,000 daily users. Why it didn't work out: Although this would significantly reduce passage transfers at the Rosslyn Station by 68 percent, there was no significant relief for other stations. The proposal was ultimately found to be infeasible due to the existing building foundations in its path. What might happen instead: An alternate plan calls for a new Rosslyn station at a cost of $1 billion, which is incorporated in the downtown loop. What it is: This proposal would split the Green Line at Waterfront-SEU. 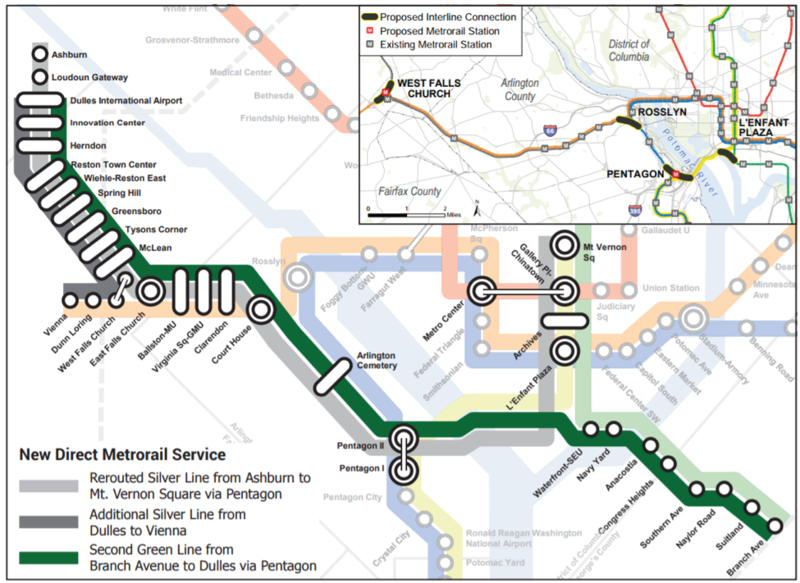 The new section of the Green Line would provide a direct connection to the Pentagon and Dulles International Airport for residents of Southeast and Prince George’s County. The second Green Line would significantly reduce passage transfers at two of the busiest stations, Rosslyn (a 90 percent reduction) and L’Enfant Plaza (a 32 percent reduction). There would also be moderate reductions in transfers at Metro Center and Gallery Place. Why it didn't work out: Drawbacks for this plan included worsening Orange Line crowding near Rosslyn, a reduction in Silver Line ridership, and only a one percent increase in users on the system. This proposal also utilized the Rosslyn Y concept, which as mentioned above, was infeasible. What might happen instead: No plans yet. What it is: Northern Virginia Transportation Authority’s long-range plan, TransAction 2040, includes extending the Orange Line 11 miles west of the current terminus at the Vienna Station. The $1.13 billion project would run along I-66, US-29, and US-50 into Centreville. Some officials have called for this extension to go even farther west into Gainesville and Haymarket in Prince William County. 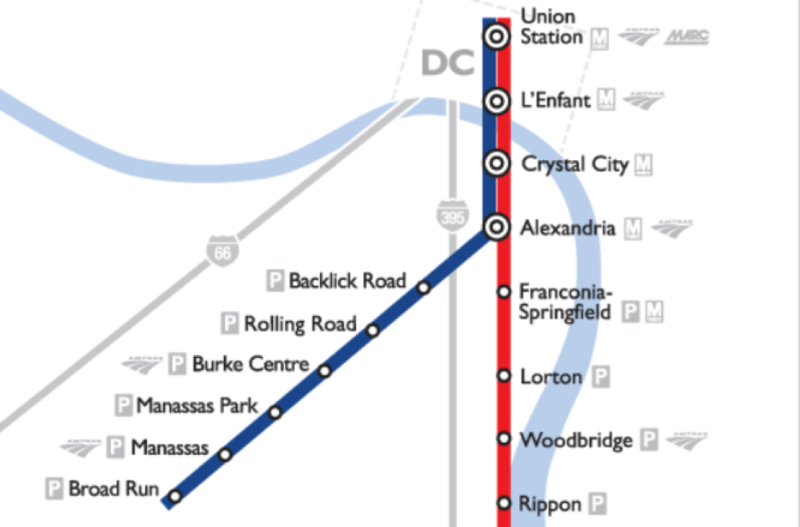 Why it didn't work out: Currently, the VRE Manassas Line provides a service that runs near the proposed Orange Line extension. This proposal would lead to more overcrowding on the Orange Line and would have to be incorporated with other projects to lessen the burden on the Orange Line to be feasible. What might happen instead: It could still happen! Despite these challenges, widening the I-66 median for the future Orange Line extension was listed as a recommended project for funds raised from I-66 tolls. What it is: This new 21-mile line would run from Friendship Heights west of the existing Red Line through Georgetown and the West End. 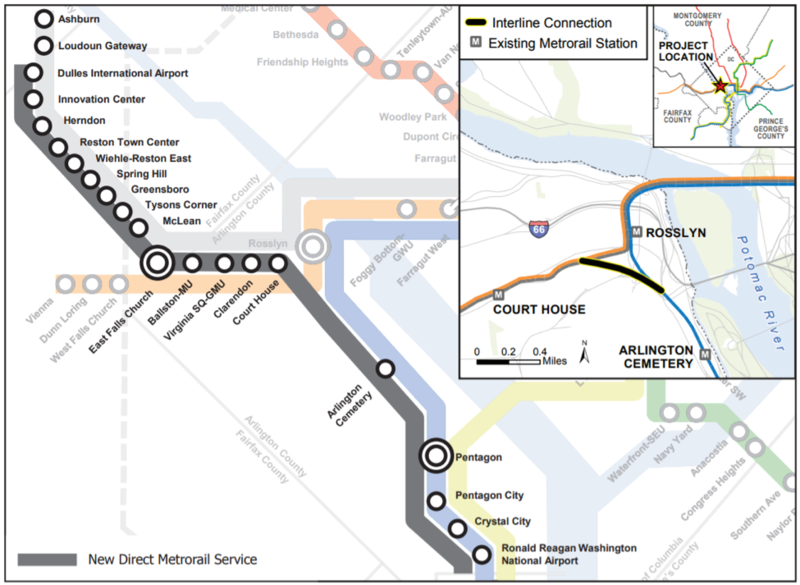 It would create new stations south of the National Mall and the neighborhoods of Eckington, Bloomingdale, and Brightwood before rejoining the Redline in Silver Spring. The Brown Line would then continue north adding new stations in underserved areas of eastern Montgomery County. Why it didn't work out: The study found that the Brown Line would add 55,000 daily riders to Metro, but decrease bus ridership by 40,000 people. There was also minimal effect on relieving congested stations. The Brown Line would end up competing with the Red Line, which would run nearly parallel with it and has the advantage of more direct service to the employment centers in downtown DC. What might happen instead: There was significant ridership at the Georgetown Station and the Union Station connection, but it was decided that these would be better rolled into the proposed downtown loop. What it is: One of the largest proposed projects involved creating a Metro line that runs along the Beltway. It involved creating 17 new stations and providing connections to 10 existing stations. This proposal was estimated to bring an extra 25,000 riders per day to the Metro system and serve a total of 115,000 riders daily. It would also provide a connection between National Harbor and Metro. The heaviest ridership was focused on the Potomac crossings with an estimated 30,000 crossings on the Wilson Bridge and 21,000 over the American Legion Bridge. Why it didn't work out: The drawback to this plan was that the areas being served had relatively low densities for both households and jobs, making it infeasible. It was also found that the additional load would worsen peak crowding on the Yellow Line. 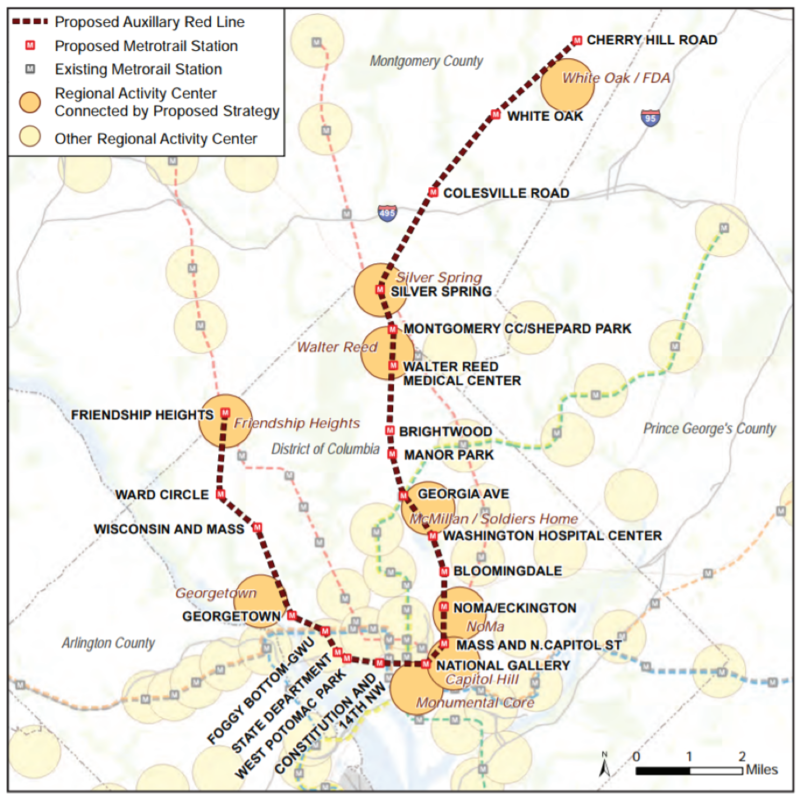 What might happen instead: Light rail (such as the Purple Line) and Bus Rapid Transit within key corridors could enhance these circumferential connections, according to Metro’s Connect Greater Washington strategy summary. Mike Grinnell has worked in the design and construction industry since 1998, and relocated to DC in 2001. He has a BS in Building Construction from Auburn University and studied Economic Development in grad school at Virginia Tech. Mike served two terms on the Potomac Yard Design Advisory Committee before moving to West Springfield with his wife and two daughters.